Vajrasattva & Palden Lhamo Puja consists of several short practices - Vajrasattva (Buddha of Purification), Chenresig (Buddha of Compassion), Palden Lhamo (Dharma Protector), and Dzambhala (Wealth Deity). During this meditation we first cleanse all our negativities through Vajrasattva practice. Then we generate ourselves as Chenresig and while holding divine pride emanate light rays to benefit all beings. Next we request Palden Lhamo to help protect the dharma and help it flourish. Finally we make requests to Dzambala for the material support needed to sustain the dharma. These practices are all strongly beneficial. Tara (Female Buddha) brings quick success in all that we do and meditation on her can help clear away any obstacles that we are facing. 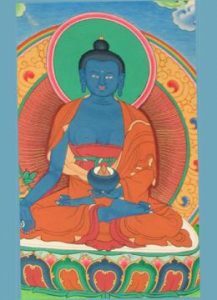 Chenresig (Buddha of Compassion) brings great blessings to all beings and meditation on him can help us to develop an altruistic heart that works solely for the welfare of others. The Chenresig meditation we do at Gaden Samten Ling is "The Inseparability of the Spiritual Master and Chenresig", a guru yoga practice written by His Holiness the 14th Dalai Lama. 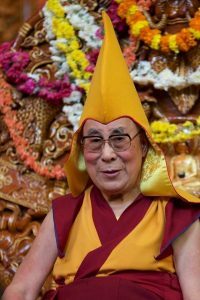 By doing this practice we are able to unite our mind with His Holiness' ocean-like mind of wisdom and compassion, receive his blessings, and share them to bless all sentient beings. Lama Chöpa Puja is performed to offer thanks to the founders and teachers of our lineage - those wisdom beings who carry on the teachings from generation to generation and who continue to guide and inspire us in our spiritual endeavours today. In particular, we pay homage to His Holiness the 14th Dalai Lama of Tibet - the living incarnation of wisdom and compassion. 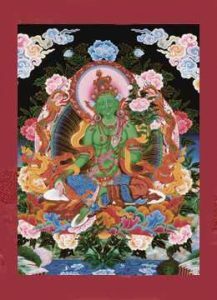 This meditation is based on the Lama Chöpa text composed by the 1st Panchen Lama Lobsang Chökyi Gyaltsen. In the Lama Chöpa, we invoke the lineage lamas of the graduated path including our present teachers who are showing us the path. 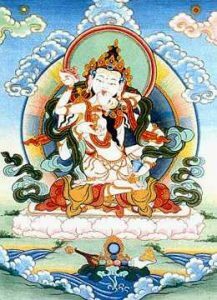 We generate the altruistic mind, visualize the merit field, pay homage to them, offer the seven limb practice, and request the lineage lamas to bless us with the same realizations they achieved – those which lead us to attain enlightenment for the benefit of all beings. The Tibetan word Tsog means gathering, collection, or assembly. The Tsog offering is a great feast offered to all enlightened beings and to all non-enlightened beings as well, including ourselves. It is one of the most important practices of generosity, and is also extremely effective for accumulation of merit. To participate fully, bring either an offering of good quality food such as bread, cookies, cake or fruit, or an offering of money, which will help to pay for the food which the centre has purchased for the Tsog. The food offered should always be of the best possible quality and quantity. 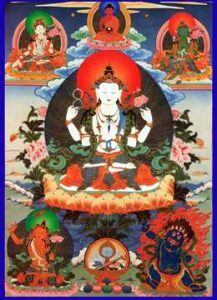 Medicine Buddha Puja is performed specifically to request healing and good health for all sentient beings. We focus on sending healing light rays out in all ten directions to bless all sentient beings and free them from all suffering and illness. During the puja we recite the aspirations of the Eight Medicine Buddhas to remind us of the powerful aspirations they made to benefit all beings.